While all segments of the U.S. population are affected by obesity, disparities exist. Children of low-income or low-socioeconomic status have a greater risk of obesity than children from higher income households. Sedentary lifestyles and unhealthy eating caused by changes in our communities, neighborhoods, and schools are contributing to this problem. Since youth spend a significant part of their day in school – on average over eight hours each day -- schools play an especially important role in promoting physical activity and healthy eating. Studies further suggest that comprehensive interventions that incorporate practice, policy, and environmental changes in schools and communities are most effective. Although these multi-strategy, practice-based initiatives are increasing, there remains a gap in efforts to assess and understand the areas of intervention reach, organizational adoption, implementation, and maintenance, especially for policy and environmental-related efforts. 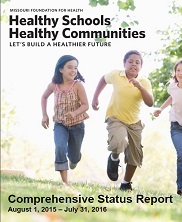 The Missouri Foundation for Health (MFH) is funding Healthy Schools Healthy Communities (HSHC), a comprehensive initiative with 25 school districts in 12 low-income communities to reduce obesity disparities and achieve health equity. The goal of this almost 10 year initiative is to create environments that support physical activity and healthy eating behaviors and decrease the prevalence of overweight and obesity by 5% among Missouri youth by 2017. 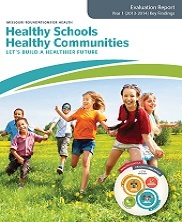 MFH’s model is to provide funds to establish local wellness committees, run by a coordinator, to jointly develop and implement action plans for their school or community. While the grantees’ action plans are individualized, building on strengths and weaknesses within each school and community, the strategies are guided by the Alliance for a Healthier Generation’s Healthy School Program Framework and the YMCA’s Community Healthy Living Index and aligned with the IOM’s Accelerating Progress in Obesity Prevention: Solving the Weight of the Nation and Educating the Student Body: Taking Physical Activity and Physical Education to School Report. Additionally, MFH has formed a team of consultants including the Alliance for a Healthier Generation, Trailnet, PedNet, Missouri Department of Health and Senior Services, and GMMB to provide technical assistance and capacity building, policy advocacy, and communications training to facilitate local efforts. The impact of a collection of school and community-based interventions, including programs, policies, and environmental changes aimed at promoting physical activity and healthy eating. The evaluation framework is informed by the socio-ecological model (SEM) and the RE-AIM framework. Read the blog post by Tamara Calise and Janie Hynson on Are you Fed up yet?